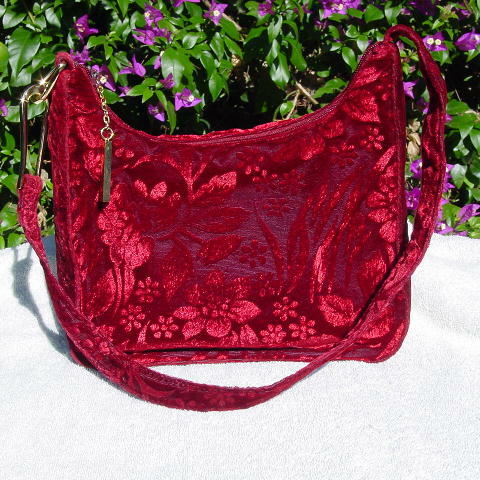 This deep red fabric purse has a floral and leaf pattern in a tone-on-tone velour on a muted dark red background. It has a 28 1/2" long shoulder strap (including the two gold-tone metal loops) and a top side to side zipper with a gold-tone chain and bar that says Sasha on it. It's perfect for the casual holiday parties and activities when you want to dress comfortably, yet add a little pizzazz to your outfit. It's light in weight, holds quite a bit, and sits easily on your shoulder. She wore it when she had to attend her Wall Street boyfriend's many office "buffet" parties.